Matthew laughs himself silly one day as he watches the banana-crazy monkeys at the Metro Zoo. That evening, bananas become Matthew's favorite food -- and he refuses to eat anything else! Over the next two weeks, he eats so many bananas that he starts to feel funny. He itches and scratches and itches and scratches until ? KABLOOEY! Suddenly, Matthew is swinging from trees and shinnying up flagpoles! His parents try everything to stop his monkey business -- doctors, veterinarians, herbalists, chiropractors, animal trainers, psychiatrists and even a psychic. But nothing seems to work. Has Matthew gone completely bananas? About George Elliott (Author) : George Elliott is a published author of children's books. 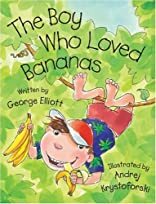 Published credits of George Elliott include Boy Who Loved Bananas, The, Barker McGee.